Best remembered today for her work with husband Boyd Raeburn’s progressive jazz orchestra of the mid-1940s, vocalist Ginnie Powell got her start in 1943, at age 17, with Raeburn’s 15-piece dance band. By December she’d joined Jerry Wald’s group, where she stayed until becoming part of Gene Krupa’s outfit in October 1944. 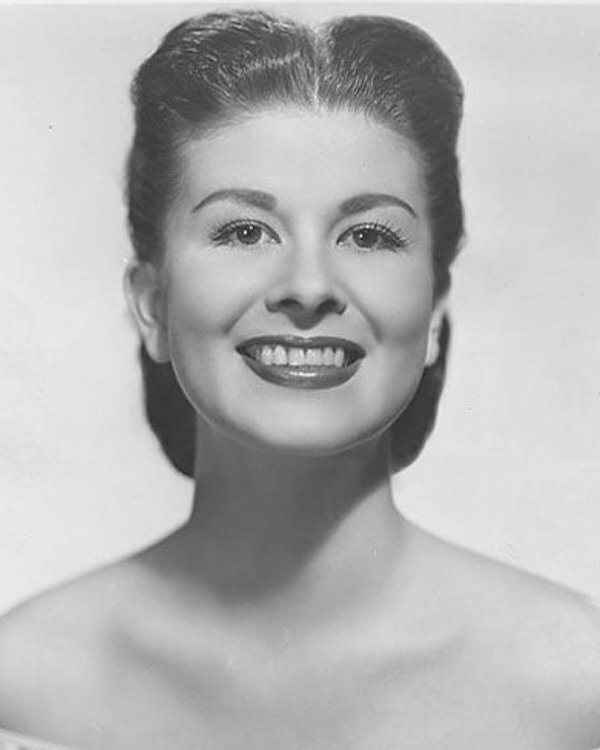 She remained with Krupa, joining Lillian Lane as one of two female singers, through at least April 1945. In early 1946, Powell was back with Raeburn, whom she’d married by that time, singing for his new progressive band, though she’d left by March to join Harry James. When James took his band East in June, Powell stayed behind on the West Coast to remain with her husband, once again becoming his female vocalist. She sang two numbers on Raeburn’s groundbreaking Innovations album in 1946 and appeared in one musical short with the orchestra. Raeburn soon lost interest in his band, and in November 1947 he and Powell planned to sign with Majestic records, where Powell was to sing with solo billing, backed by his orchestra. The deal fell through in December, though the couple had already recorded five masters by then, despite the fact that no contract had been signed. Majestic gave copies of the masters to Raeburn, and the couples’ agent, Willard Alexander, shopped them around to various labels. Atlantic Records, a new company at that time, eventually purchased them in April 1948 and later released them. Majestic’s copies of the masters were auctioned off in October of that year after the label went bankrupt. Powell kept busy as a solo artist with radio and nightclub work in 1948 and 1949. She made appearances as a vocalist on Morey Amsterdam’s radio and television programs from 1948 to 1950 and also on Ed Sullivan’s television show in 1949. In early 1949, she signed with Decca, releasing two sides in February. Raeburn put together short-lived touring outfits in 1949 and early 1950 with Powell as vocalist. She took a break from show business in late 1950, though, to have the couple’s first child. In the spring of 1951, she returned to singing in clubs and on the radio until taking another, much longer, break late the following year for the birth of their second child. When Raeburn formed a new commercial dance band in 1956, Powell returned to singing, touring with the orchestra through late 1958. Raeburn eventually gave up his music career, and the couple moved from their New York home to Nassau in the Bahamas, where Powell passed away from meningitis and pneumonia on the 25th or 26th of July, 1959. She was 33 years old. Sources at various times indirectly cited her as having sang for Charlie Barnet and Benny Goodman, though no direct sources verify those claims. Obituaries dated July 29 and 30th, 1959, cite her date of death as “last weekend” without giving a specific day. “Ginny Powell.” IMDb. Accessed 18 Apr. 2018. Advertising. Manitowac Herald Times [Manitowac, Wisconsin] 20 Jul. 1943: 2. “Monroe, in Hub, Must Sprint to Nab Vanities 34G.” Billboard 22 Jan. 1944: 21. “Palisades Sets 2 Mil. As Goal In Bond Drive.” Billboard 24 Jun. 1944: 44. Advertising. Dothan Eagle [Dothan, Alabama] 20 Sep. 1944: 3. “On the Stand: Gene Krupa.” Billboard 21 Oct. 1944: 16. Goodstein, J.B. “Musicalities.” Gruber Guidon [Camp Gruber, Oklahoma] 30 Mar. 1945: 2. Advertising. Ottumwa Daily Courier 12 Apr. 1945: 13. “Advanced Record Releases.” Billboard 30 Mar. 1946: 32. “Music as Written.” Billboard 22 Jun. 1946: 25. No headline. Billboard 29 Jun. 1946: 45. “On the Stand: Boyd Raeburn.” Billboard 20 Jul. 1946: 22. “On the Stand: Boyd Raeburn.” Billboard 15 Feb. 1947: 19. “New Raeburn Ork.” Billboard 13 Dec. 1947: 19. “Majestic Pacts for Desmond, Raeburn Likely.” Billboard 15 Nov. 1947: 19. “Majestic Must Drop Deals.” Billboard 20 Dec. 1947: 19. Advertisement. Billboard 24 Jan. 1948: 82. “Caniff To Appear On Ohio Story Program.” East Liverpool Review 29 Mar. 1948: 18. “Follow-Up Reviews: Cafe Society Downtown, New York.” Billboard 10 Apr. 1948: 45. Kilgallen, Dorothy. “Voice of Broadway.” Pottstown Mercury [Pottstown, Pennsylvania] 17 Apr. 1948: 4. “Music as Written.” Billboard 24 Apr. 1948: 21. Shoemaker, Neil. “Yours for the Dialing.” San Marino Tribune 8 Jul. 1948: 7. “Tonight's Radio Headliners.” The Madison Wisconsin State Journal 10 Jul. 1948: 3. “Majestic Inventory, Both Masters and Other Assets, May Get Piecemeal Sale.” Billboard 16 Oct. 1948: 20. No headline. Billboard 5 Feb. 1949: 20. “Danceland Books Raeburn's Band.” The Cedar Rapids Gazette 24 Apr. 1949: 40. “Between Commercials.” Berkeley Daily Gazette 8 Oct. 1949: 7. “Music as Written.” Billboard 11 Feb. 1950: 41. “Births.” Billboard 16 Dec. 1950: 50. “On Broadway with Earl Wilson.” Lowell Sun 25 May 1951: 13. “On Broadway with Earl Wilson.” Lowell Sun 15 Jul. 1951: 42. “Today's Radio Program.” The Bridgeport Telegram 26 Jun. 1952: 34. “'Hit Parade' to Come From Camp McCoy.” The Capital Times [Madison, Wisconsin] 12 Sep. 1952: 15. “Boyd Raeburn Plays for Valley Ball April 27.” Winchester Evening Star 12 Apr. 1956: 1. “Reviews and Ratings of New Popular Albums.” Billboard 15 Sep. 1956: 26. “Latest in Recordings.” The Arizona Republic 16 Dec. 1956: 3-12. “Dream Street.” Uniontown Morning Herald 4 Jan. 1957: 26. “Dance to Close MC Homecoming.” The Charleston Gazette 23 Oct. 1957: 4. “RPI Students to Sponsor Spring Formal.” Troy Times Record 25 Apr. 1958: 10. “Many Planning To Attend Bal De Rose At Longshore.” Westport Town Crier 18 Sep. 1958: 16. “Not Learned.” Monroe News Star 29 Jul. 1959: 2. “Dance Singer Dies in Nassau.” Sarasota Herald Tribune 30 Jul. 1959: 1.